This is the radio that I have used daily for three years under demanding real world field conditions. The reason for this is it surpasses any other radio I have used for line of sight distance (when paired with a properly tuned antenna) and outstanding audio. This might be partly due to the Superhetrodyne front end it uses. Because I have to use numerous frequencies, I also appreciate the zone feature that contains channels for different demographics. One other major reason for using this over the 8200 model, is the potential ability to find a partner who, (if carrying the same model and is set-up properly) has disappeared into a tree well. It is available in VHF or UHF, and is not a dual band radio (see UV-MD390 for dual band). It underwent a major firmware update on Dec 16, 2016, these radios ship with that update. The inclusion of the GPS is not to take the place of a navigation device. It's main function would be to send out the GPS co-ordinates of the radio to another DMR radio when the alarm is activated. It could also function as a backup GPS if the user also has a paper map for reference. We have tested a pair of these and found the GPS co-ordinates to be accurate to within 3 meters. They use the BeiDou Navigation Satellite System and DMS format for the co-ordinates. These units have some promise because you can query any other unit to find its location. Or if a unit sends out an alarm, it will send the location out with it. This could come in handy for lost individuals, or to locate someone who fell into a tree well while skiing if you also have the ability, in the field, to transpose those co-ordinates onto a map or into a navigation device. (See the video at bottom of page for more information). These are a rugged well made unit with very good audio performance and advanced features, it is targeted to Professional Guides, SAR, and advanced mountaineering groups. 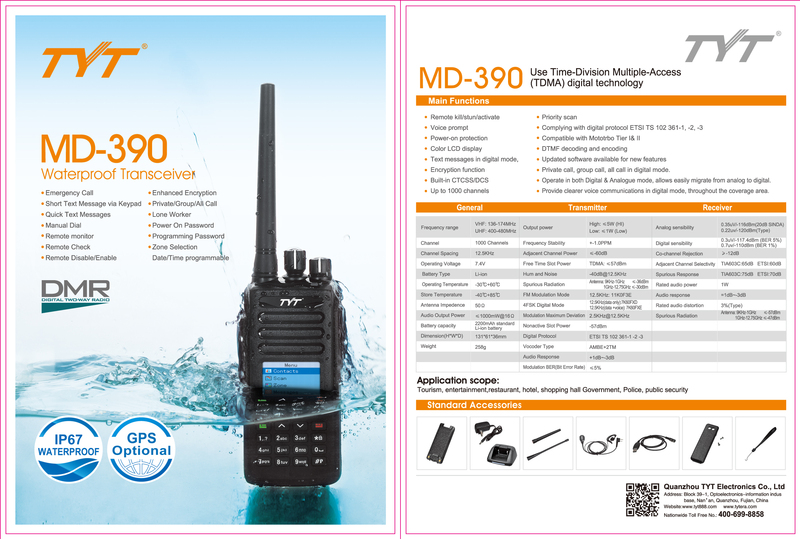 The Tytera MD-390 digital radio uses Digital Mobile Radio (DMR) Tier 2 Standard protocol. It is compatible with the popular MOTO TRBO series Tier I and II using standard encryption, as well as other makes and models of DMR supported radios. It is also compatible with any existing analog two-way radio operating on the supported VHF frequencies. Contents of package: Tytera MD-390 VHF digital mobile two way radio, one stubby antenna, belt clip, AC charger, 2200mAh lithium-ion rechargeable battery, owner's manual, programming cable, and one year manufacturer warranty. It comes with 2 stock OEM antennas that are only suitable for light duty use at frequencies at or below 155MHz (see video for more details). For proper performance through the full range of VHF frequencies, and to avoid damage to the radio, the correct Smiley antennas should be purchased along with the radio.